Greetings, Sportsmen’s Americana Music Foundation members! I am thrilled to share some information with you about a wonderful program called Nurs’n Blues. 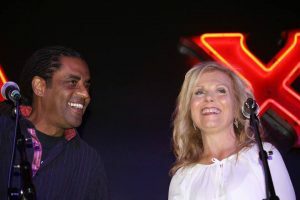 Nurs’n Blues is a program conceived of by Buffalo Music Hall of Fame singer Patti Parks. 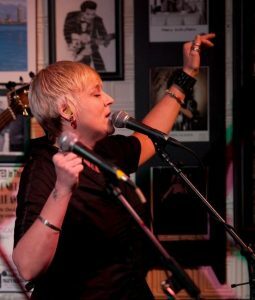 Anyone who knows Patti is aware of her passion for blues music. She also is a fierce advocate for those among us struggling with chemical dependency. Patti felt there was not enough variety (or “adjunctservices,” as we call them) for folks battling the demon that is addiction. She had heard of music therapy and found out that it is not uncommon that a music therapist would provide services to the chemical dependency population. Her idea, however, was anything but common. It was beautifully unique: why not have a music therapist exclusively use blues music with this population? After all, the blues genre provides us as much with stories about overcoming challenges as it does stories about dealing with emotional disappointments. We can trace the origin of the blues back to the slaves, who were a special population. So too are folks struggling with substance abuse a special population. The parallels between the roots of blues music, the blues genre itself and folks struggling with chemical dependency are substantial. Here is where I came into the picture. Patti needed an MT-BC (board certified music therapist) to implement her wonderful and innovative idea. A music therapist is required to have a bachelor’s degree, complete a lengthy internship, pass the Certification Board for Music Therapists (CBMT) exam and maintain professional liability insurance. A music therapist does an assessment on all clients. From this assessment, goals and objectives are formulated. Typically, these are not musical goals, but goals that improve the quality of life of the client. Therapeutic goals may address issues that relate to behavior, expressive and receptive communication, cognitive skills, social interaction and emotional expression. The vehicle that I get to use (lucky me!) to reach these goals is music. The music therapist creates music interventions that are receptive experiences, re-creative experiences, composition experiences and improvisatory experiences. Additionally, much work is done regarding the fortification of coping skills (recognizing triggers that make the client want to use his/her drug of choice, and creating mechanisms that help quell cravings). The Nurs’n Blues program is a one-of-a-kind music therapy program. Presently I do weekly group sessions at two rehabilitation facilities. I work with every age range from 13-year-olds and up and the families of the clients are involved in some sessions. Since its inception in January of 2016, the Nurs’n Blues program has serviced over 900 folks for Horizon health Services and over 250 young women for Renaissance Addiction Services. In order to continue this crucial work, we are having a benefit for the program on Saturday, May 25, at The Cove on Transit Road in Depew. The event is from 3 to 10 pm. I will be performing, as well as The Patti Parks Band and many other great bands, including Grammy nominee Kenny Neal. 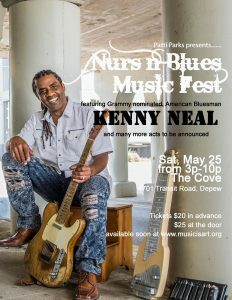 Please visit the Nurs’n Blues Music Fest facebook page (https://www.facebook.com/NursnBluesMusicFest) for more information. The Nurs’n Blues program is sponsored by the Western New York Blues Society and Music Is Art. Thanks so much, my SAMF brothers and sisters! It is with humble gratitude and sheer luck that I am able to play a part in the wonderful, eclectic, and innovative program that is Nurs’n Blues.